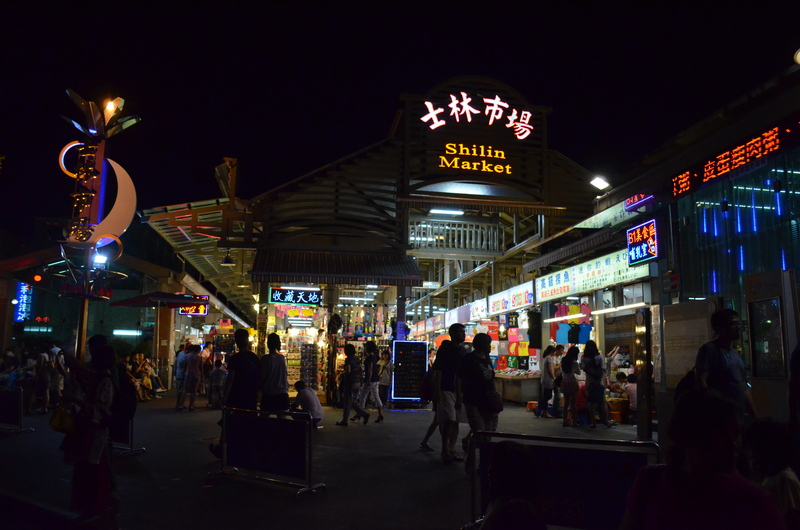 Shilin Night Market, which was the last one we visited, was also the largest market we went to. 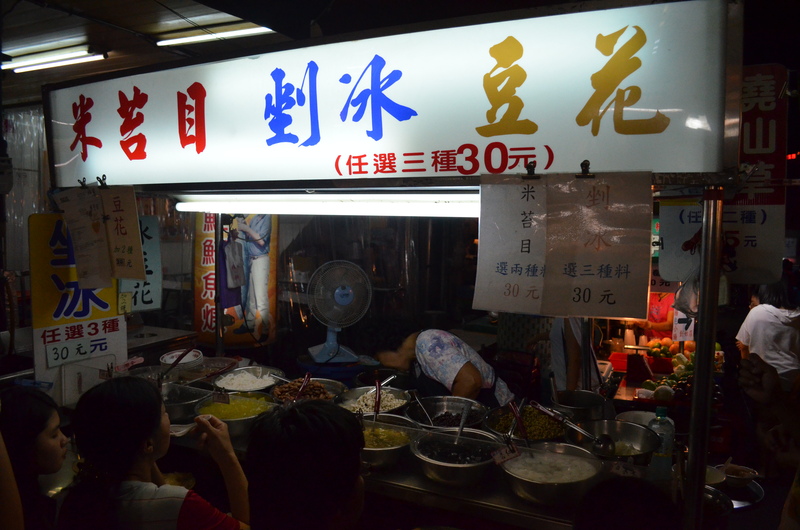 It took us a while to find the food stalls, after walking past row upon row of kitschy t-shirt and jewelry stores. 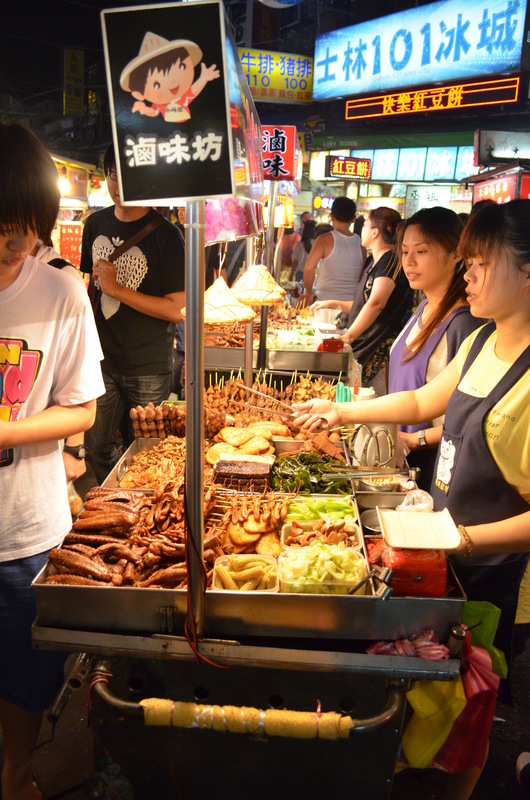 There weren’t any big signs (that I remember, anyway) but somehow we made our way to the stalls where all the grilling and frying and searing and queuing and gawking and pointing and drooling and chewing was happening. Probably on the strength of my nose, frankly. 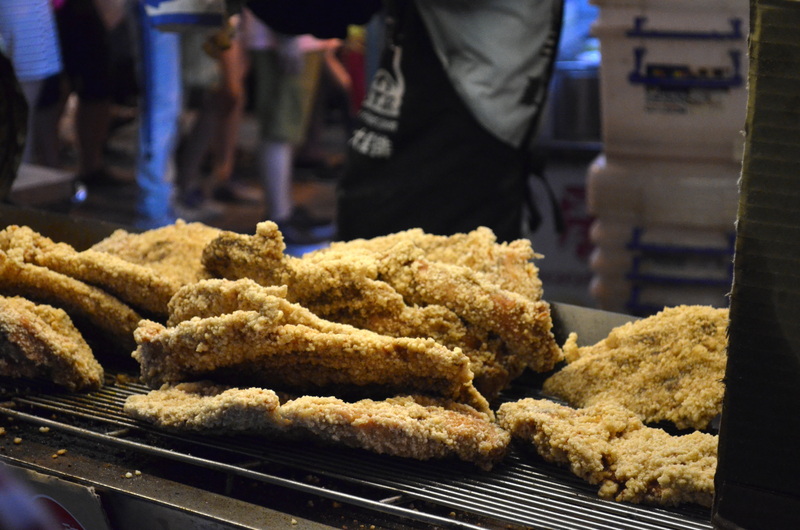 I definitely lined up for the chicken cutlet, which has a uniquely sweet and peppery seasoning that seems to expand even more with the frying. 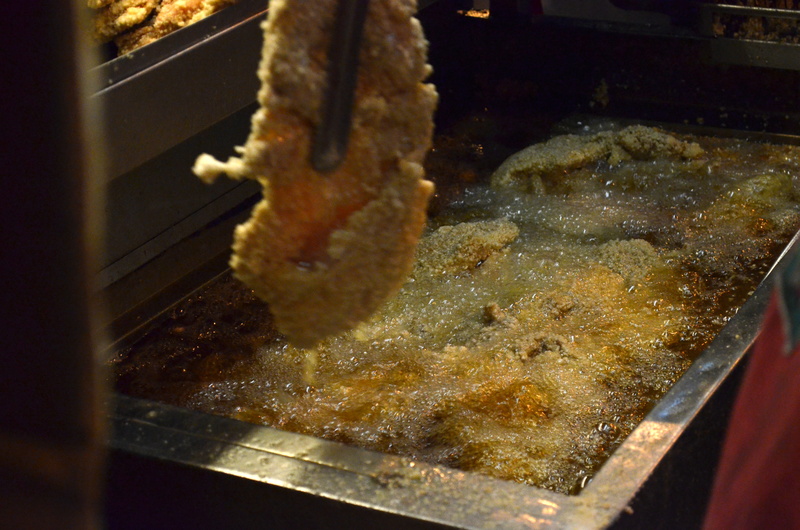 The aroma is hard to distinguish from the oiliness, but you don’t really dwell on that when you’re inhaling the crunchy batter and juicy meat. 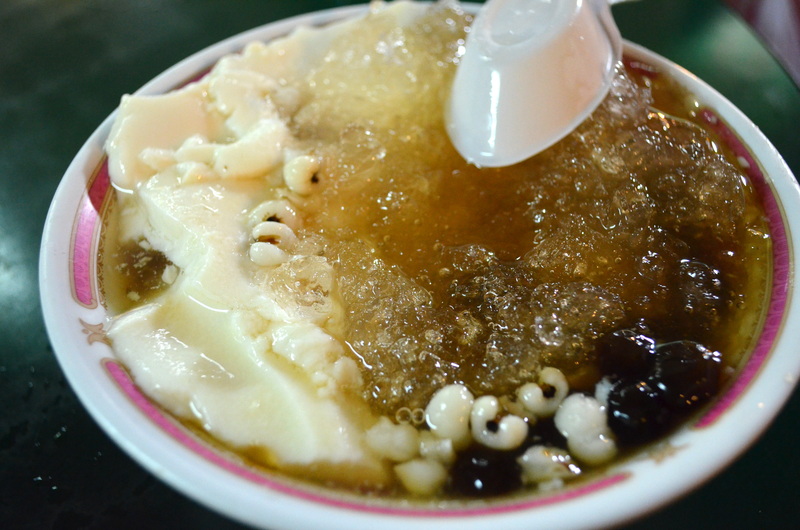 I couldn’t get through a whole one. 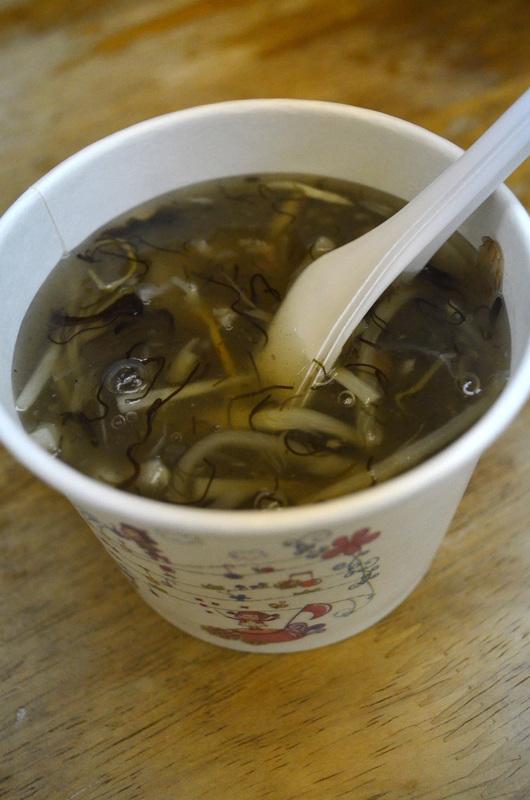 We stopped by a small sitdown shop selling crab soup (螃蟹羹), and though you can’t really see the crab pieces in the picture (they were plentiful), the soup was a wonderful, thickened blend of crunch (bamboo shoots), umami (shiitake mushrooms), and sliminess (black fungus shreds of some sort). 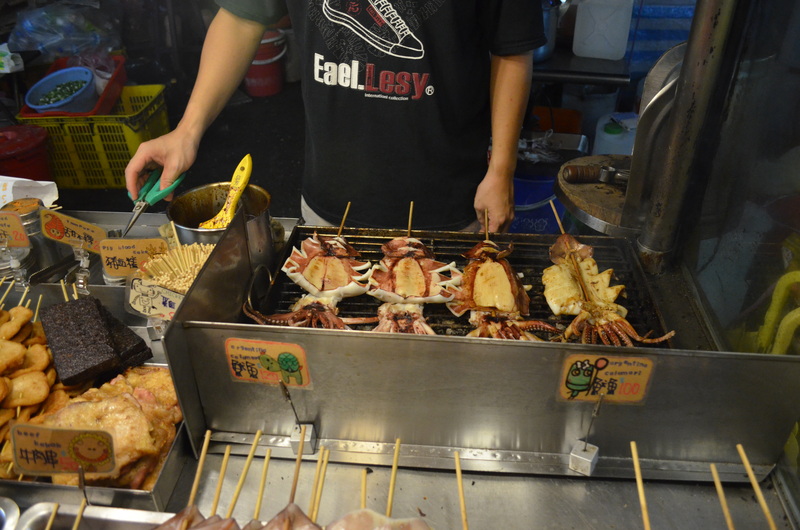 My sister, with her newfound addiction to grilled squid, was quite happy to find another 烧烤 stall full of skewers. 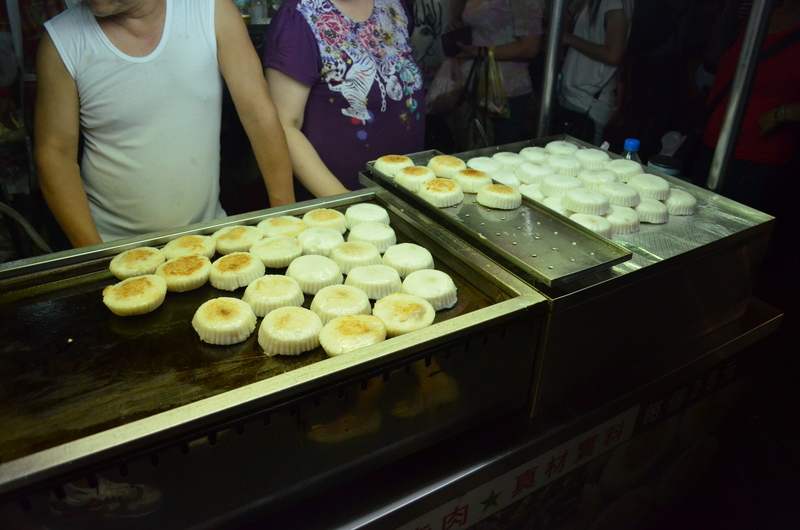 These flat pan-seared dumplings were an odd rice-flour texture (a bit like turnip cake), with a morsel of seasoned pork stuffing, the real reason I would put up with that consistency of dough. 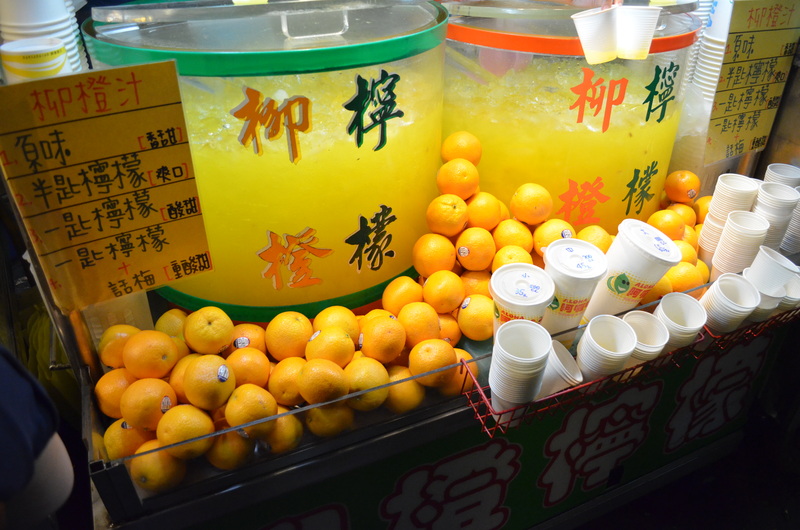 There were also a good number of juice stands serving up some miraculously sweet orange juice. 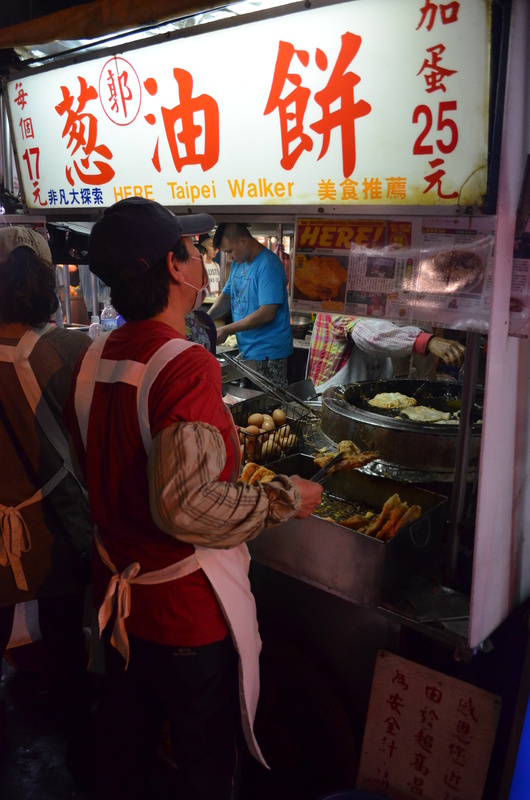 The citrus, just tart enough, was a good balance to greasy, fried or grilled snacks we’d scarfed down along the way. 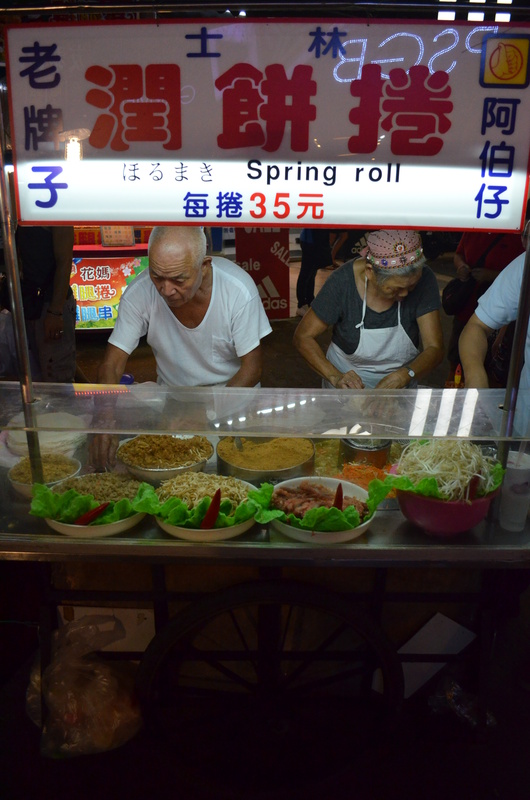 This old couple was making fresh (non-fried) spring rolls, which have a bit more texture and variety in the filling, with raw bean sprouts, chili sauce, crushed peanuts, pickled and stir-fried veggies, etc. 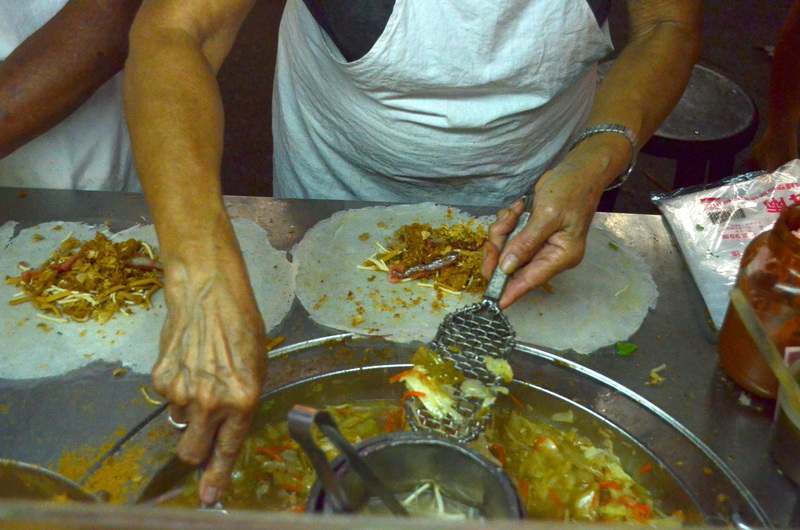 I was mostly drawn to the stand by the proprietors, who hardly looked up from their work and hardly spoke to each other but worked in perfect unison. 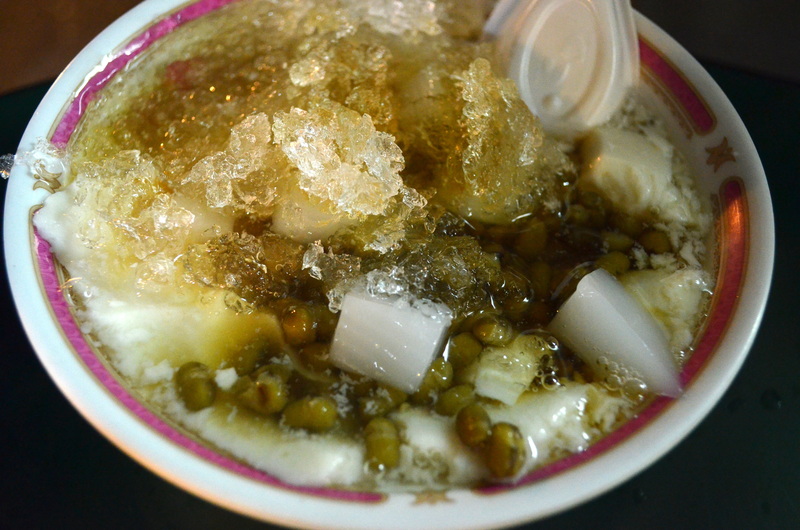 For our last stop, we got two bowls of iced silken tofu (豆花) with a selection of toppings, most of which are exceedingly healthy (e.g., barley, lentils, almond jelly). 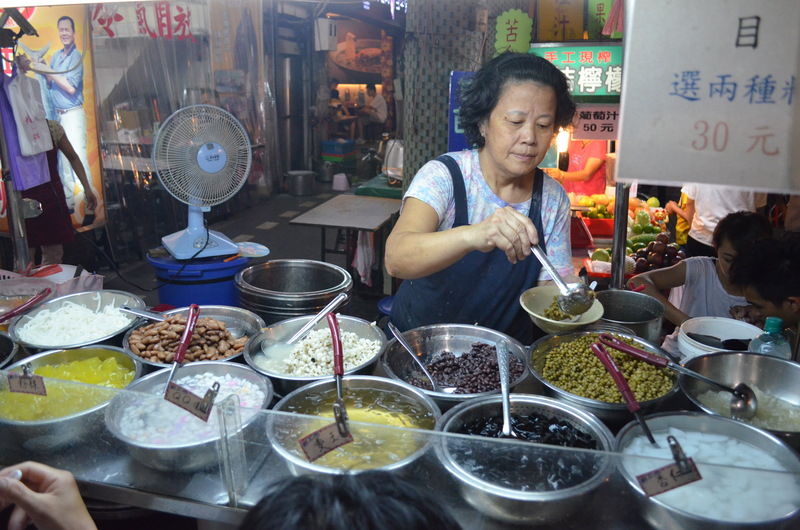 The owner, a soft-spoken older woman with a kind voice, typically shows up at noon and stays until the market closes, except when it rains. 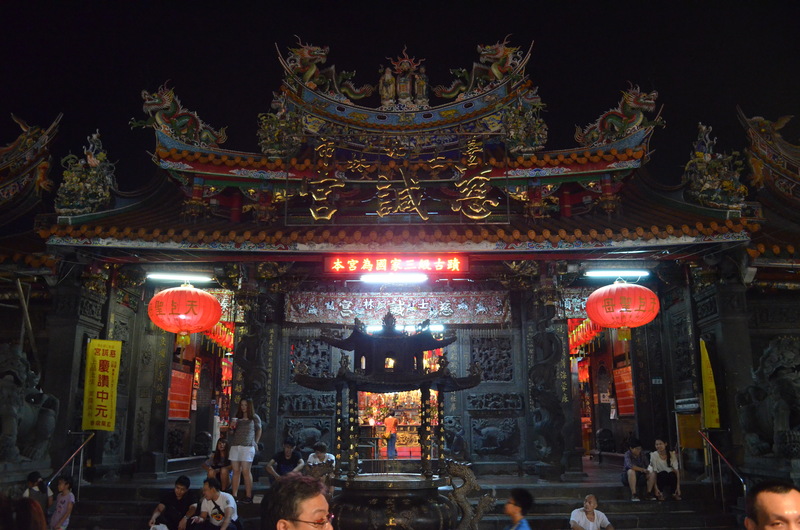 As we walked in search of an exit to the street, we passed Cixian Temple, with its gaudy rooftop dragons and the rich palette of colors in the darkness. 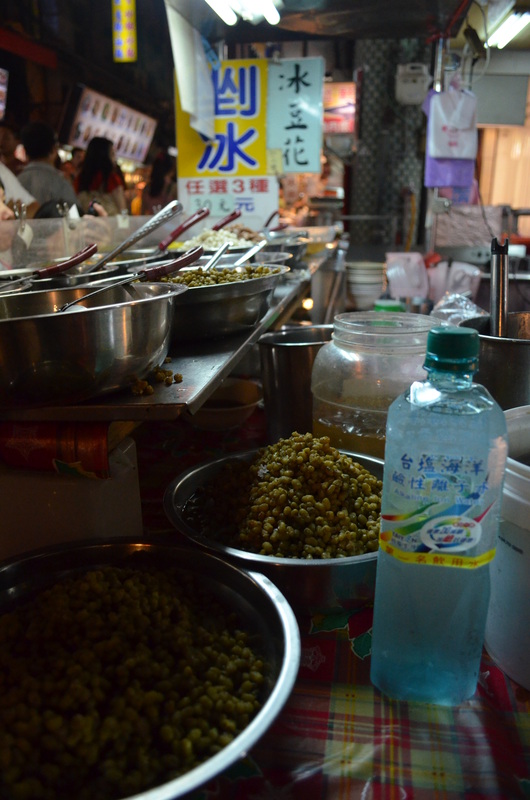 Shilin was a bit overwhelming, mostly because of its expansive size, spanning multiple square blocks of city and a whole gamut of retail and food options, sometimes interspersed in narrow side streets and difficult to find. 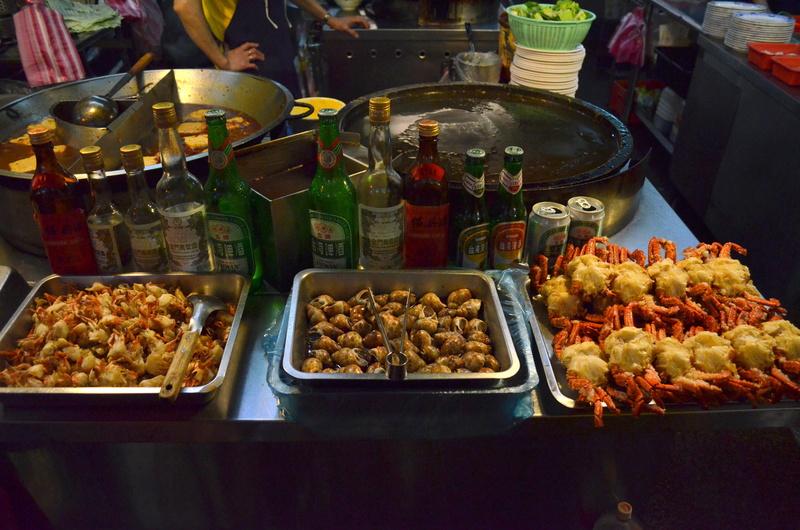 But as far as sheer number of choices go, Shilin was also the more comprehensive among the three night markets we visited, and a good place to start in terms of narrowing down what snacks you enjoy and might want to get a better-quality version of in Taipei’s other venues.